I’ve been meaning to do some more blogs like I used to. 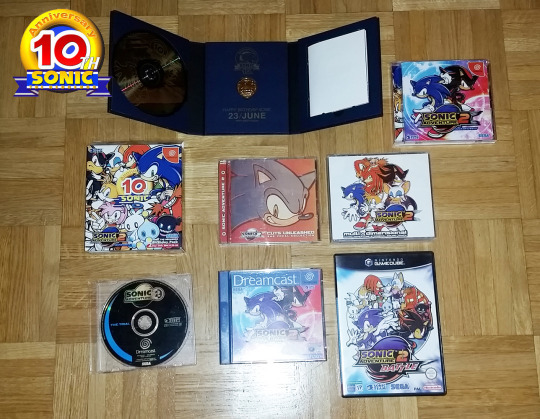 Let’s have a random look back at a bunch of Sonic Anniversary releases! Lately I’ve been getting back into Sonic for some odd reason. Blame Sonic Mania! 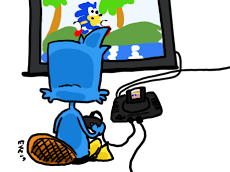 Since his creation back in 1991, Sega tends to celebrate Sonic’s birthday every 5 years or so (more or less). Let’s review them one by one. 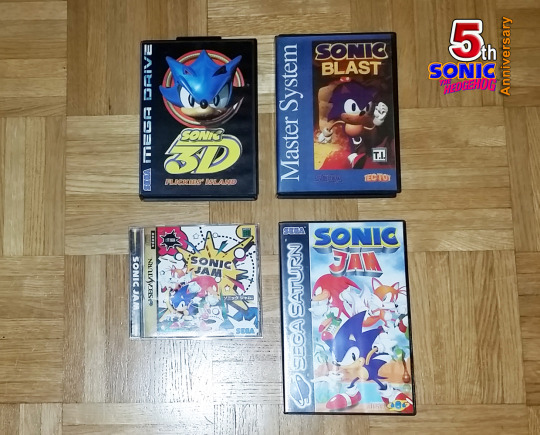 Although Sega seems to consider Sonic 3D Blast (MD/Saturn)/Sonic Blast (GG/MS) the actual 5th Anniversary title in recent history or galleries, “Sonic’s first jump into 3D to celebrate his 5th anniversary”, I personally like to consider Sonic Jam released the following year in 1997 the actual celebration game. Hey, it kinda works! It’s a compilation collection featuring various bonus and secrets as well as a proper Sonic 3D world as an interactive menu of sorts! 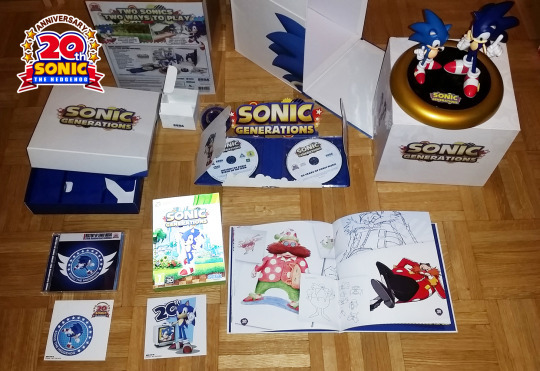 Sonic’s 10th Anniversary was the first proper big celebration! One of the final best surprises of the Sega Dreamcast! First announced via a really captivating demo offered along Phantasy Star Online! Japan saw the game receive a fantastic anniversary Collector’s Edition featuring a gold coin, a soundtrack and more! The Gamecube release followed shortly after the end of the Dreamcast, even before Sega got around re-releasing Sonic Adventure 1! I also put the game’s official soundtrack in the shot, just because. Sonic’s 15th Anniversary was... a big letdown. Sonic’s creator Yuki Naka left Sega. Sonic 2006 was supposed to be a big reinvation, reboot and throwback to Sonic Adventure 1, even featuring a remix of Sweet Dreams, the end credits of Sonic 2, but it was a big unplayable mess instead... I’m not even surprised they took the 15th Anniversary logo out of the game. 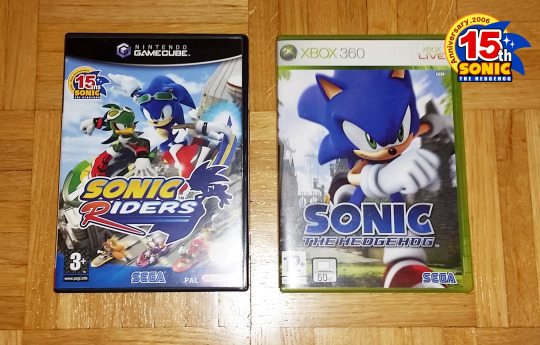 Which oddly means the only game to properly celebrate the anniversary with the logo ended up being Sonic Riders. A pretty silly but fun racing game, featuring a fun SAdventure-style plot for a racing game! And Yuji Naka’s last supervised Sonic game. 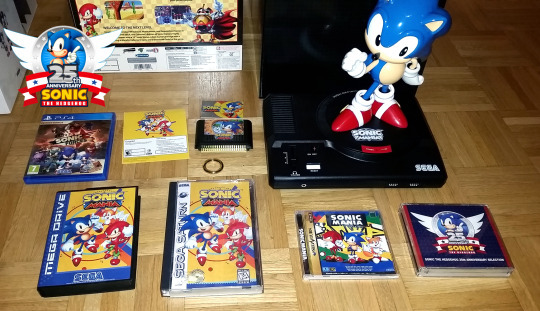 Thankfully, Sonic’s 20th Anniversary was even bigger than his 10th Anniversary! Classic Sonic and Modern Sonic together! At last! The game itself is a fantastic fanservice mix of both old and new. The game itself received a bunch of great soundtracks with either classic tracks or the remixes from the game. And the collector was just massive, kind of an oversized take on SA2′s one. A great statue, more soundtracks, a gold ring, an artbook... what’s more to ask? Finally we have Sonic’s 25th Anniversary. Sega didn’t want to rush more Sonic games for a while after Lost World, which oddly means the games supposed to celebrate the 25th’s anniversary actually came last year in 2017, while the anniversary was in fact in 2016...!? Sonic Forces is.. Sonic Forces. Like it, hate it, it certainly wasn’t entirely what we all expected. Sadly the game was only available as a digital download. So I included in this shot the self-made custom art I made for a Pal Mega Drive, US and Japanese Sega Saturn mockup covers. So I can pretend the game actually exists in my collection. And for the curious ones, here’s a quick shot of the Anniversary soundtrack release, featuring stickers and posters. And that’s all for this blog! Enjoy, y’all!